This page is dedicated to Lucius Farish and Dale Titler who, as pioneers in this field, began to recognize the physical effects of unidentified objects on water. The following proposes a possible explanation for the observed interaction between unidentified flying objects and water. Wrested from seemingly divergent eyewitness accounts, it posits that the reaction of the water around an emerging craft implies the existence of a displacement field, one that exhibits electromagnetic tendencies. What at first seems like a series of unrelated accounts is shown to illustrate consistent behavior when the distance between the object and the body of water is considered. My interest in water-related UFO sightings came long ago while reading the books that have interested all of us. However, those books usually had only one water-related case in them. The mystery to me was: How something so profound could be neglected? Why was there no book – or even a chapter – exploring the UFO’s ability to operate in and out of water? As time went by, books were published with short chapters on the subject. Finally in 1970, Ivan T. Sanderson published Invisible Residents, which described water UFO cases from front to back. However, the idea of how they accomplished their penetration and emergence from water was once again overlooked in favor of the concept of another civilization residing underwater on our planet. Why should we get excited about a few water-related reports scattered amongst our ever-popular UFO cases? Because in these cases we can see the path of what we must accomplish in order to actually travel to the stars. A new propulsion system… and a field surrounding the craft protecting it from micrometeorite hits, acidic climates, hostile gunfire, and whatever else the craft encounters. If we wanted to send men to Venus, material would have to be developed to withstand the heat and the acidic atmosphere of the planet. However, if we could design a vessel based on the “alien” craft we have experienced over the past fifty-plus years, no further modifications would be necessary. As I continued my collection of reports, the major problem was not the lack of incidents, but the lack of text on what the water was doing during those incidents. For the most part, the cases report UFOs going into or coming out of water and then go into detail about the craft or its travel. This is understandable as the craft is the unusual thing, not the water. I eventually became frustrated that there was no clear correlation between what was occurring with the water in the different reports and began to think that perhaps all these disjointed cases were leading me nowhere. One night I sat at my drafting board and decided to draw each case group as a filament surrounded by a bulb. The resultant drafting work came as quite a shock to me. It should be noted that this hypothesis is based on what could be considered a small percentage of the more than 850 cases contained on this site, and does not take into consideration any testimony concerning UFOs entering bodies of water. The following sections will illustrate the various phases of UFO reaction with water. 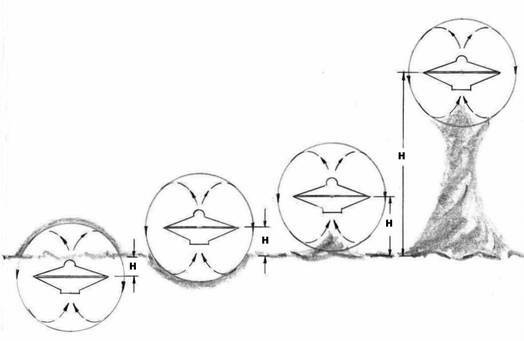 The drawing at the beginning of each section represents a simplified idea of the UFO field -- which has many times been referred to as “electromagnetic,” and to that end I show the UFO as if a bar magnet had been inserted into its center. This concept was inspired by a sketch of a UFO with a surrounding magnetic field from an older addition of UFOs and Anti-Gravity by Leonard G. Cramp (See the full case with sketch at: 04-? ?-1958 on this website). Notice how if this idea is correct, the force is pushing upwards, causing a bulge. Some morning, I’ve forgotten which one, because I have long since lost the log book, I was rudely awakened in that dark, cold hour before dawn, realizing that my forward progress had stopped and that I was taking water. Great sheets of water flung over her forward deck, screaming down the sides of her cockpit foaming, some of it coming aboard. So in under shorts and barefoot, and the rest of me bare, I came suddenly awake, went into the cockpit and discovered she was dead on course, sails drawing. But she was not making any progress while over her forward deck was considerable depth of solid water and a great thrashing up ahead. Looking in the direction of the thrashing, I perceived a great glow, like a big school of herring coming near the surface and disturbing luminous bacteria . . . only it was not the right Color. It was more deeply orange. In color it was like the annelids, which are common off Bermuda in certain seasons, but this was one continuous glow and not a collection of nickel-sized blobs of light. The glow seemed to come from a plateau of water, which was causing solid water to flow over my decks, hence impeding my forward progress. On seeing this "windjammer" apparently bearing down on me, l had gone into reverse gear again, backing off once more into calm water . . . perhaps a hundred yards from the disturbance. Even as I realized my "windjammer" was something else, the splashing and sloshing of water stopped, and this vessel, or whatever it was, rose out of the water and the glow surrounding it subsided so that her running lights were much more highly visible. She had lifted off the water and was heading towards the now dimly visible continent of North America in a long, upward slant and going at what seemed to be a tremendous speed. This reference (Original): BEYOND REALITY #18, January 1976, “Encounter in the Gulfstream” by Neil Deane as told to George Earley. Notice that in this position the force upon the water is pushing downward. 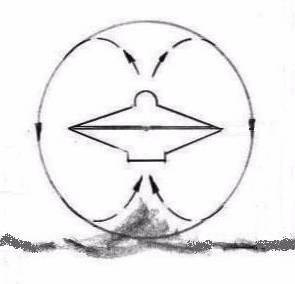 In these cases the UFO is seen “just” above the water, its field acting as a plow while it invisibly moves water in the direction of the witness. In several cases where the UFO did not move in the direction of the witness, but simply continued upward, we find the terms “tunnel” or “hole” used to describe what was observed below the UFO. Indeed this tunnel idea was expressed in a story of an abduction where the witness saw “strange walls of the tunnel” as he traveled below an ocean (UFO Contact from Undersea by Dr. Sanchez-Ocejo and W. Stevens). ...They then were afraid of being dragged away in the water and not being able to regain the shore. A.W. succeeded in grabbing the trunk of a coconut palm. He held on with his right arm, holding on to the woman with the other. At their feet was now a continuous barrage of strong waves, so that one instant before the sea came within 50 m of the dune! Suddenly, three bright lights showed on the object blinding the witnesses. It was like three projections pointed in their direction, other luminous beams coming from the sides of the object, perhaps also from its upper side or from the unseen side of it. Certain of the beams seemed oriented upward, but A.W. could not confirm this, so much did the three beams pointed toward shore blind him. In all the light it was white that dominated, but there was also yellow, pink and blue-green. A.W. wore glasses that were lightly tinted. He was struck by the blue and green colors of the waves lighted by the object. The most interesting detail of his recount concerned the surface of the sea under the object. It was not flat but dug in the form of a depression. A.W. estimated its depth at a few meters, 5 or 6 perhaps. Its diameter was comparable to the length of the object, on the order of 25-30 meters. These are the descriptions he made, on one hand, the depression dug in the sea under it and on the other hand, of the advancing waves on the beach up to the dune. It is not possible, given the condition of the observations to obtain a very precise description of the profile of the depression (cup), in particular of the bottom of it. This reference: Phēnomēnes Spatiaux (Space Phenomena) a publication of GEPA, GROUPEMENT D’ĒTUDE PHĒNOMĒNES AĒRIENS (Group for the Study of Airborne Phenomena). Dated March 1976. Notice here the water, assuming the shape of the upward flow of the field apparently entering the UFO. This is probably the single most important witness sighting in terms of understanding the total effect of the UFO upon water. There have been similar descriptions in other accounts, but they are usually tempered by terms like “upward swelling” or “raised water,” language that does not clearly show a mounding or mountainous form. We have here a fixed view of an effect, but also the beginning of what might occur when the craft moves farther up vertically. Between Maceió and Parapueira, Brasil, April 1958. This reference: Piece For a Jig-Saw, by Leonard G. Cramp, p. 133, London, 1966. This type of case involves a UFO hovering over water. The witness describes a column of fog, mist, haze or water reaching from the surface to the object. The terminology generally used in the description is “sucking up water”. This column, I believe, is caused by the rotation of a field in a vertical plane that encompasses of the UFO. This is best visualized by going back to Physics 101: Imagine a bar magnet running vertically through the center of the UFO, iron filings sprinkled on it so as to observe the magnetic lines of force going up from the top (North Pole), arcing to the sides and down, then back up through the bottom (South Pole) – see figure 4. As this field rotates it causes a friction on the abutting atmosphere, causing an updraft at the bottom. 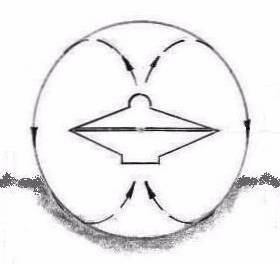 This, in addition to an oft-observed horizontal rotation of one part of the UFO, causes a swirling vortex to be formed below the UFO. This can be similar to a person rotating a finger through still waters in a pot of water at a rapid rate – eventually causing a maelstrom to occur. Could this not be the cause of waterspouts? Waterspout: 1. a moving, whirling column of spray and mist, with masses of water in the lower parts, accumulated because of a tornado at sea or on other large bodies of water. After four or five minutes of waiting, the ball backed away. Across the road, it began creating a vortex at the base of the mountain. The rocks started rising into the air.... They would shake from side to side. There were hundreds of them [the largest about the size of melons]. They started going around in a circle, like it had complete control over them... Then the thing went way up in the air and it looked kind of like a tornado and it was all red.... The only noise you could hear was this clickety-clack, clickety-clack when the rocks hit together. Then the light blinked out, and everything crashed down the mountainside and onto the road. The ball blinked back on again at the top of the mountain and meandered away. In Bob Pratt’s book UFO Danger Zone the dresses of a few women are pulled up and over their heads; also in another case, a man dangles below the UFO, without the aid of the usual truncated beam of light that is so prominent in abductee literature. Snake River Canyon at Twin Falls, Idaho... On each side there was a tubular-shaped fiery glow, like some sort of exhaust. He said that when it went over trees, they didn't sway back and forth but rather the treetops twisted around, which suggests that the air under the object was being swirled into a vortex. He noticed what seemed to be propeller-like lights running around the concave bottom of the saucer. "One detail in connection with the silver-bottom section I noticed very clearly. There was something whirling around the bottom section, sort of like a big propeller or a series of propellers might do. The movement was clear; the bottom part did not turn. Something kept whirling around the whole thing," he told, the Circleville Herald. This reference: MUFON Journal #432, April 2004, “Farmer’s report of UFO hovering over buildings still believed 56 years later” By Joel Barrett The Circleville, OH, Herald, 02/02/2004 plus many UFOCAT references. Costa Rica... The second object moved towards the far side of the crater and, having crossed the column of ashes, performed similar manoeuvres before disappearing behind the volcano, in full view of the principal engineer, who was some distance away from Castillo and his colleague. Both craft seemed to induce a kind of whirlwind effect, as though 'produced by a propeller rotating at high speed', Castillo reported. The Steven Michalak Incident at Falcon Lake, Manitoba, Canada. Paragraph 6. The attached photographs were taken at the site. No 1. Taken from approximately 12 feet up in a tree facing in a south-westerly direction, showing the outline of an approximate 15 foot diameter circle on the rock surface where the moss and earth covering has been cleared to the rock surface by a force such as made by air at very high velocity. For comparison, the prospectors ax and Beta counter were left in the approximate circle center. This reference: From documents of the Canadian Department of National Defence, Training Command Headquarters, Westwin, Manitoba. Dated: 1 Sep 1967. With Thanks to researcher Don Ledger, for forwarding to me. England. Staffordshire, Stoke-on-Trent, bentilee... it flew low overhead and apparently landed in a field about 400 yards away. No sound was heard, but one witness felt "wind" as it passed overhead. This “suction” on the surface of the water is exactly the same as if a tornado was to pass from land over a body of water. The bottom part would be viewed as a mounding of water; as we look vertically up the column, the water is more molecular and appears as fog, mist or a continuation of the water itself. 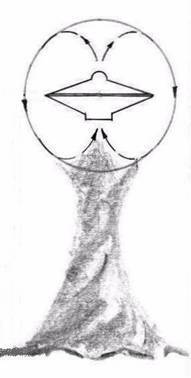 The vertical movement of this water or water vapor gives the impression of water being sucked into the UFO. An example of this column can be seen in a photo by Ed Walters from Gulf Breeze, Florida, which was published in a book by him and Dr. Bruce Maccabee, entitled UFOs Are Real and Here’s the Proof. One has to look closely to see the column, but it is there, silhouetted against the darker water (See 04-26-1994 on my website for sketch and photo kindly provided by Dr. Maccabee). As the UFO gains altitude, the column of water is seen to collapse, or in the case of night sightings – disappear. This reference: UFO Danger Zone, by Bob Pratt, Published 1996, pp. 231-232. Below the UFO the water began to chum. Mist swirled into the air. A center plume of water shot up to the bottom of the UFO. It was a waterspout. The UFO moved slowly to the left and I aimed the camera and took Photo 49. (See case 04-26-1994 –CF-) Ten to fifteen seconds passed while I stared at this amazing scene. Suddenly the waterspout collapsed. The UFO angled off to the left, climbed at a sharp angle, and disappeared into the hazy sky. This reference: UFOs Are Real And Here's The Proof by Edward Walters and Bruce Maccabee, Ph.D., pp 56-57, 100-105 © 1997. Reprinted on my website with Dr. Maccabee’s permission. These cases of witnessed effects on water inspired the idea that these effects might be tied together in relation to each other. Some of the cases are of a UFO apparently “taking on water” not by means of tubes, pipes or hoses (as is the case in several reports), but by a column of water lifted by an unseen force directly to the craft. In the other scenario the UFO causes an observed “indentation” of the water. It would appear that these reports are contradictory of each other because of the differences in the effects; however, I believe that the differences are only the result of distances between the field of the UFO and the water. 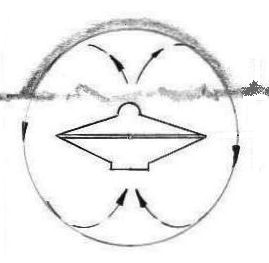 In figure 5, we have what could be an illustration of the complete steps of the UFO’s exit from a body of water, and the water’s reaction as it does so. These craft operate by physical principles! Though the details behind their operations are unknown to us, they should not be considered beyond our understanding. Excusing the craft’s functions as paranormal, or that of holographic projections, or the result of some other impenetrable obfuscation is not the way to understand the physical principles governing its technology. We should concentrate on the craft’s mechanics – because it is clearly a machine.